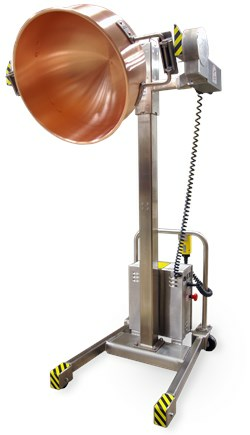 The LifTILTruk bowl lift is a SAFE ONE PERSON lift & pour answer to handling heavy mixing bowls and other containers. Our MOBILE models "A", "B", "C" & "D" are 12VDC powered hydraulic lifts for pours from table-top up to 104 inches / 2640mm. Lift & Pour anywhere convenience, with on-board battery charger for overnight recharging using standard voltage.